Sub series: 7113HME1-7115HME4 Milton and Edith Hunter Collection I (1999.03.0821-1999.03.0851) [there are a lot of great photos if you click on the collection link]. Milton and Edith married when they were past 50. They had been married before. They shared an unusual history as Edith (Kiler) was a descendant of the first lighthouse keeper of Trinidad, Jeremiah Kiler, and Milton was grandson of Frederick Harrington, the second lighthouse keeper at Trinidad. The son of Jeremiah Kiler was acting lighthouse keeper for a brief time in 1888 after his father’s death. He then went to S.F. Bay area and was in the lighthouse and custom service several years. Frederick Kiler was in charge at Trinidad from June 30, 1888 to August 7, 1888. His father had served from 1871 to 1888. 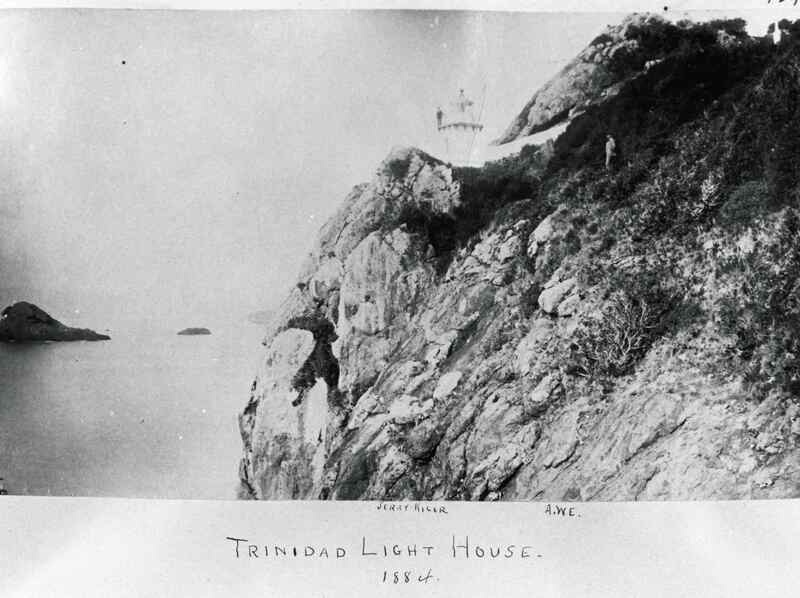 Frederick was born in 1850 and had assisted his father at the lighthouse. Frederick L. Harrington was lighthouse keeper from 1888 to 1916. Edward Wyberg served until 1925, followed by Malcolm Cady. This entry was posted on Monday, April 22nd, 2013 at 11:28 am and is filed under Historic Buildings, Interests, Merging Yesterday and Today, old photos, Old Things, Random Historical Info. You can follow any responses to this entry through the RSS 2.0 feed. You can leave a response, or trackback from your own site. particularly enjoyed the photos of the “Karok” but I am skeptical that the male attire was authentic. Looks like plains Indian regalia to me. Not sure Nan. I wouldn’t think that tribal members would wear inauthentic regalia but don’t know for sure.